If one studies markets trading during the week, one thing becomes glaringly obvious-- there is too much cheap money sloshing around markets these days (See Chart Below). You no longer have healthy, two-sided markets in most asset classes. This is not a good thing for true market based price discovery, and ultimately leads to the creation of market bubbles. There are so many bubbles today that once QE2 ends, and the tightening cycle begins, investors are going to lose a lot of money. ﻿Gold, Silver, and Oil, for the most part, trade as one giant asset class these days against the US Dollar. Copper used to be in this asset group, but China decided it wasn`t going to buy Copper at these high prices, and the buying stopped in a very dramatic fashion. Eventually, Copper no longer could sustain the $4.65 a pound pace once China called the traders bluff. The Middle East turmoil has far less to do with the current price of Oil. 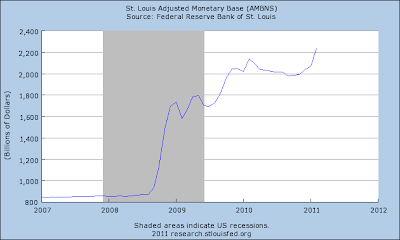 The market has no supply disruptions, and Saudi Arabia didn`t materialize into the much hyped unrest contagion story. However, the US Dollar Index weakens by 30 cents and Gold goes up $15 and Crude goes up $2.50 in just one trading session. The US Dollar weakness is one thing, as we have had dollar weakness before. The real difference these days is the juice in terms of excess cash that needs a place to go, i.e., sloshing around financial institutions, responds and exacerbates market moves on a daily basis. This results in any dip being bought up in almost any market, and this quarter, it has finally reached a head with equities alone having their best quarter since 1998--wasn`t that around the time of another famous bubble created around the mania of the internet? 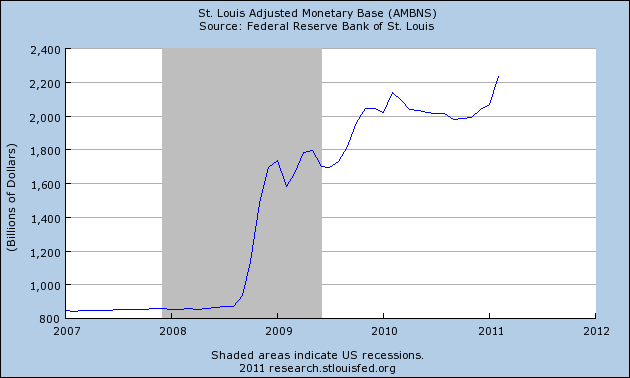 Obviously, the Federal Reserve has overstayed their welcome again and is too late in responding to market conditions. The very thing they promised they would be able to correct this time after the last bubble they helped create with such low interest rates stemming from a monetary policy initiative that made house flipping a State sponsored sport. Even if the Fed stopped QE2 tomorrow, and raised interest rates by 50 bps, the damage is already done, and we will start to really see the total magnitude of effects six months from now. However, even though Fed Chairman Ben Bernanke says he can hold an emergency meeting tomorrow and raise interest rates immediately if conditions warrant, that is just Fed speak and not based on reality. In reality, the Fed takes months just to reach a consensus, then they have to send signals to markets to prepare markets for policy changes, and this usually takes months, and then finally they act. 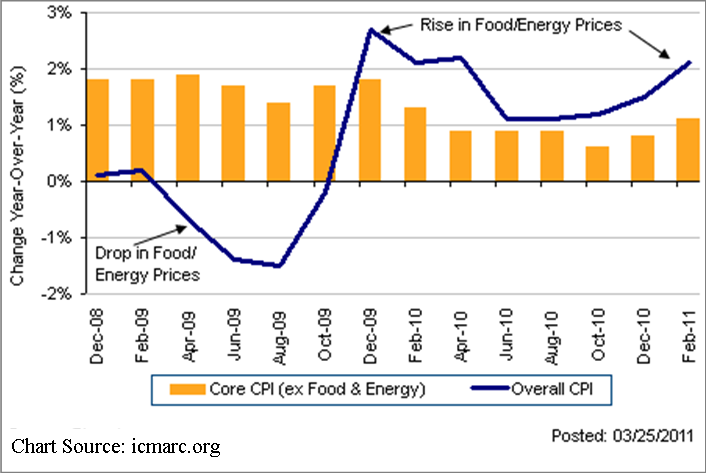 In short, the Fed cannot do anything fast, let alone making monetary policy changes at the first sign of bubbly market conditions like we have today as exemplified currently with runaway food and energy prices (See Chart). This has always been one of the drawbacks to the U.S. monetary system--the Fed over compensates in markets through excessively lopsided market intervention, which inevitably just creates another unintended consequence down the line. 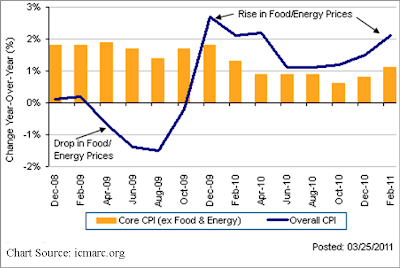 We are just now working through some of the vestiges of the last housing bubble created by excessively loose monetary policy, and lo and behold, we are creating yet another inflation bubble in food and energy with a new round of excessively loose monetary policy. What is that definition of insanity, doing the same thing over and over again, and expecting different results? And here we are—trapped in this seemingly never ending cycle of bubble creation....will we ever learn?